The TC652/653 are integrated temperature sensors and brushless DC fan speed controllers with FanSense™ technology. The TC652/653 measure their junction temperature and control the speed of the fan based on that temperature, making them especially suited for applications in modern electronic equipment. The FanSense™ fan fault detect circuitry eliminates the need for a more expensive 3 wire fan. Temperature data is converted from the on-chip thermal sensing element and translated into a fractional fan speed from 40% to 100%. A temperature selection guide in the data sheet is used to choose the low and high temperature limits to control the fan. The TC652/653 also include a single trip point over temperature alert (Tover) that eliminates the need for additional temperature sensors. In addition the TC653 includes an auto fan shutdown function for additional power savings. 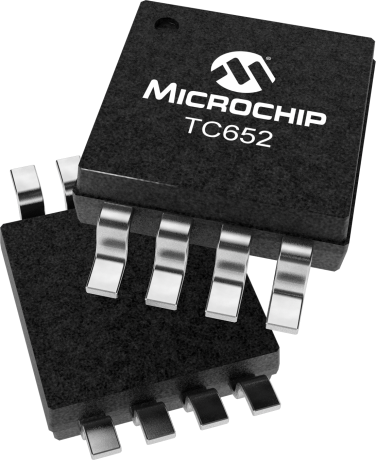 The TC652/653 are easy to use, require no software overhead, and are therefore the ideal choice for implementing thermal management in a variety of systems. FanSense™ is a trademark of Microchip Technology Inc.